Tetramer of 2 full length N-terminal Flag tagged recombinant histone H4 units and 2 N-terminal His tagged recombinant histone H3.1 units, produced in E. coli. 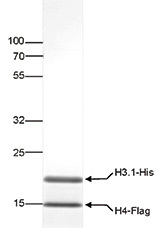 SDS page of the Recombinant Histone H3.1-H4 tetramers. The position of the proteins of interest is indicated on the right; the marker (in kDa) is shown on the left. 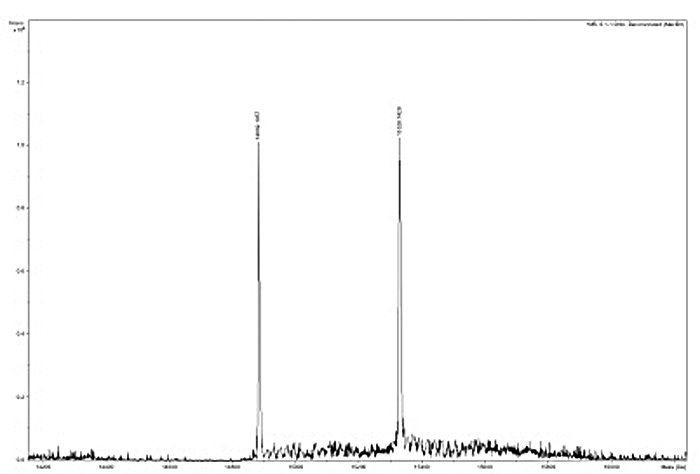 ESi-TOF analysis of the Recombinant Histone H3.1-H4 tetramers. Diagenode strongly recommends using this:	Recombinant Histone H3.1 - H4 tetramers (Diagenode Cat# C23010013). Click here to copy to clipboard.